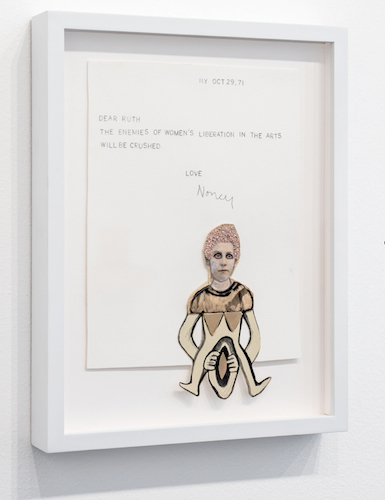 Margaret Meehan, Dear Ruth, 2015, graphite, vintage cabinet card, glitter, glass, paper, 12 1/2 x 9 1/2". “Every Witch Way but Loose” is a complex show in which Margaret Meehan takes on a variety of sources and images—from cinema, music, feminist activism and suffrage to Nancy Sinatra’s iconic 1966 song “These Boots Are Made for Walkin’”—to explore and illuminate present-day hostilities toward women and reproductive rights in the United States. The entrance of the exhibition is replete with three drawings: A Study in Human Dignity, Sun on the Horizon, and White Cake (all works cited, 2015), which take specific scenes from the movies Rosemary’s Baby and Harold and Maude—featuring actress Ruth Gordon’s character in each film—as examples of women imagined by culture as monsters. The exhibition is an obvious treatise on women’s liberation and blends historical periods to illustrate an ongoing struggle. Collaged cabinet cards—photographs common in the late nineteenth-century as portraiture—of women line a wall in the adjacent gallery, with corresponding titles such as I’m for Sexual Freedom and I Can Bring Home the Bacon. A video titled Box of Matches, combining the theme song from Rosemary’s Baby and the music video for Sinatra’s 1966 hit, also plays in a corner. Meehan’s exhibition is a collision of references, histories, and time. For instance, the piece Dear Ruth reimagines Nancy Spero’s infamous 1971 letter to Lucy Lippard, which stated: “The enemies of women’s liberation in the arts will be crushed.” Meehan once again bends historical acuity by copying the letter exactly but readdressing it to Gordon from Sinatra. “Every Witch Way but Loose” tackles women’s current fight to be treated as equals by illustrating the cyclical nature of the endeavor.